I have been waiting (not so patiently) through the long summer days of heat and humidity that seemed to drag on and on… waiting for the mercury to mercifully settle somewhere below seventy. This weekend, my friends, has brought a smile to my previously melting face. Clear blue skies and 60-degree days, nights in the 40s! I could really get used to this. 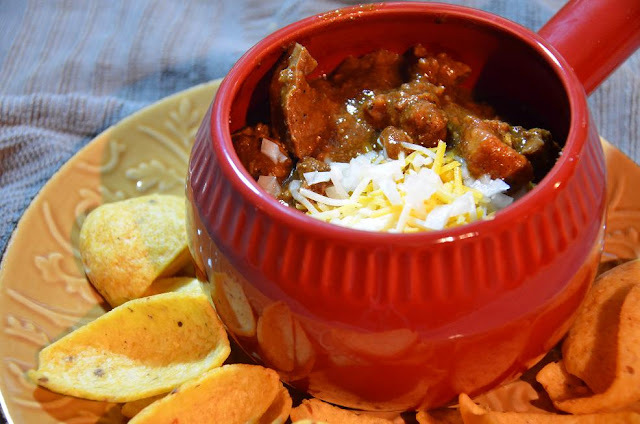 With the welcome chilly nights comes the craving for chili days. Texas red, that is. 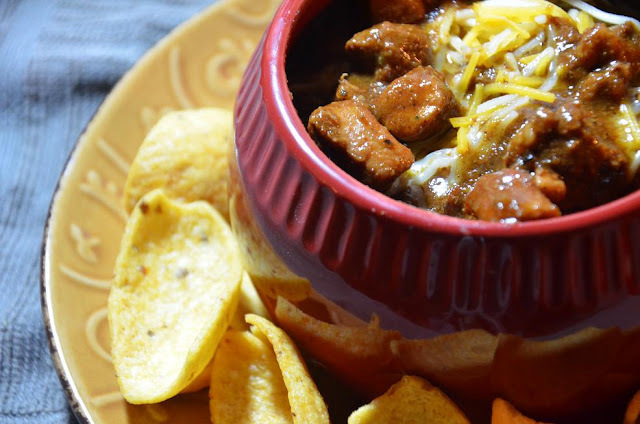 Chili brings back memories of high school football games, where the concession stand sold hot chocolate and Frito pie. Why was Frito pie so awesome? A small bag of Fritos, split down the side, with industrial canned chili ladled in (no beans of course…this is Texas, after all). If you were lucky, you may get a sprinkling of cheese on top, or a small spoon of nacho cheese (another questionable culinary topic). But for some reason, Frito pie was awesome. Perhaps it was the atmosphere, the camaraderie, the Friday night lights… who knows. It was magical, but then those were magical years. Present day (adult years) chili and football is different. Chili competitions are everywhere, with cooking teams who are dead serious about holding their recipes and methods sacred. Tailgaters munch their own chili concoctions with beer chasers. Armchair quarterbacks watch the game from the kitchen while cooking up their favorite spin on this regional treat. Texas red, as purists will tell you, is simply beef and chiles. No beans, no tomatoes, no nada. Some folks like to add a secret ingredient here and there, such as chocolate, cinnamon, coffee…which a purist would argue redefines your dish. I do agree with them that beans have no place in a Texas chili. But I like my chili the way I like it; I don’t need it to fit a mold. When you make your own chili, you experience firsthand the orchestration of the ingredients melding together in the cooking process to reach that heavenly carnivorous pinnacle. I have never actually committed this to a recipe until now, as it has always been a labor of love, without consideration for measurement. I measured everything very carefully this time, including every last chili and seasoning (you will notice that there are a plethora of peppers listed – I will explain this as we go). I have dubbed this gem Texas Twister; I like to think of it as Texas Red, turbocharged. 4 pounds of MEAT. Allow me to explain. 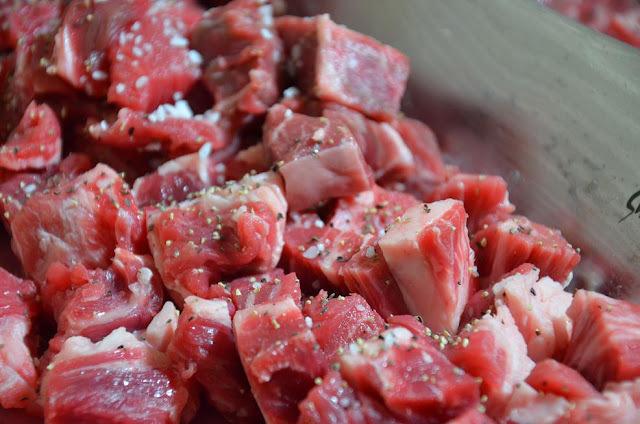 I use a combination of meats and textures, adding to the complexity of the dish. I use cubed beef (approximately 1/2-3/4 inch cubes), ground beef, cubed pork, ground pork, and hot breakfast sausage, ground). You can use whatever you like, and whatever you can find, in whatever proportions you wish. 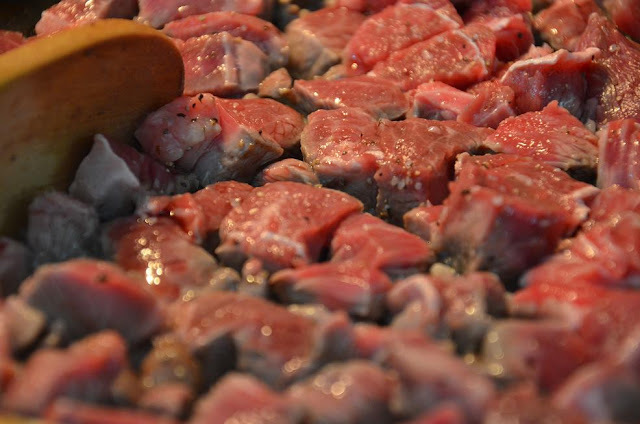 I like to use marbled meat to ensure that it comes out very tender. Season each with salt and pepper. In total, about 4-5 tablespoons of good chile powders. You can experiment and tweak this to your own taste, using your own combination of chiles. The blend I have concocted here is actually a nod to a group of guests I will be sharing it with – the heat factor has been toned down (it would be rated a medium heat). When I make a batch of chili just for myself, I add more of the hotter chiles, including Ghost Peppers! You can certainly make a good chili with fewer; I understand that availability can be an issue. But this is the way I like to do it since I have the pepper collection on hand - I end up mail ordering for best selection. I have been a huge fan of chiles for years, growing them, tasting them, roasting them, experimenting with them. They have different flavors and nuances, and their heat will actually occur at different times while you are tasting them. For instance peppers such as the Habanero and Chimayo have a delayed heat that builds up. Arbol, African bird pepper, Cayenne and Serranos have a quick, bright heat that hits you right away. Jalapeno has a nice “green” flavor, and the heat comes in mid-taste. Heat a large skillet on high. 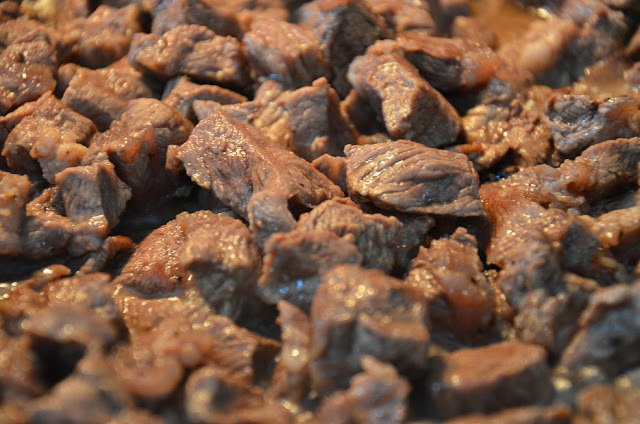 Brown your seasoned diced meat, a batch at a time (with a single layer). You want a nice caramelized brown crust on the bottom, so keep the heat high. 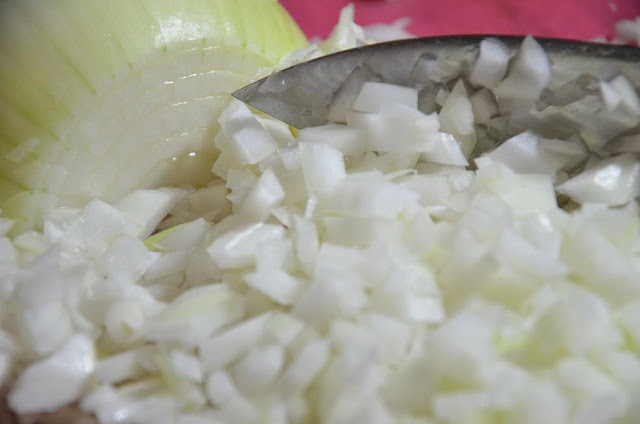 As the first batch is browning, cook your onions. 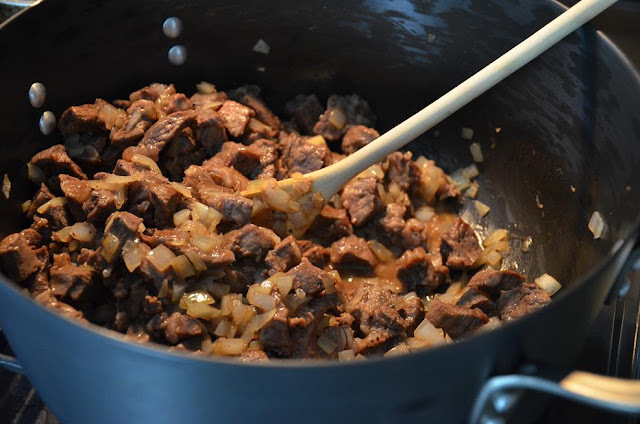 Keep an eye on the meat, and turn/stir once it is good and browned on one side. In a large pot on medium-high heat, brown the butter. Add onions, do not stir for a couple of minutes. 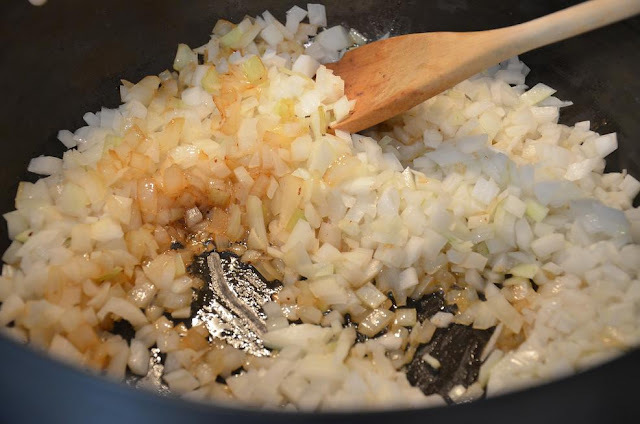 Allow the bottom onions to begin to caramelize (but not burn! ), for a hint of sweetness (I do not like to add sugar to a dish to offset the slightly bitter chile edge – this is my solution). Stir, and cook another 2 -3 minutes or so until the onions begin to turn translucent. Add the first batch of browned meat to the onions, stir to blend. Cut the heat to medium. Add Rotel tomatoes. Cover the pot as you cook. Reheat the skillet on high, and brown the next batch of meat. Drain excess grease if needed; add meat to pot. 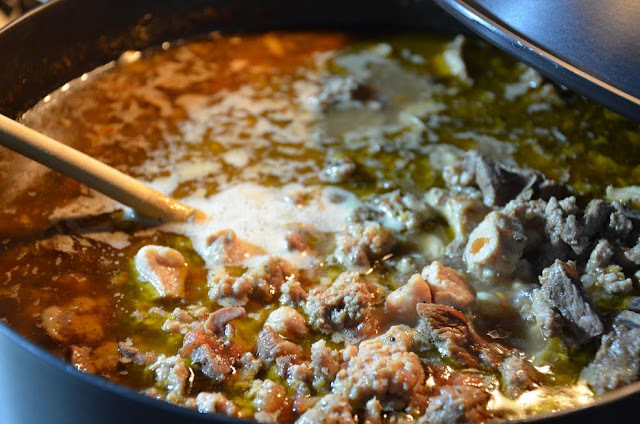 If the meat is not overly fatty/greasy, you can dump it all in the pot to save the tasty liquid. You can always skim excess fat later. Once all meat is browned and added to pot, skim any excess grease off the top if necessary. Add cumin, oregano and garlic, along with all the chiles. Stir until perfectly blended. Cover and simmer 1 hour. Combine cornmeal, flour and 2 tablespoons of water to make a runny paste with no lumps – add an extra spoon of water if necessary. Stir into the chili, blending quickly as you go to prevent lumps. Cover and simmer for 30 minutes. Your chili is now ready to serve! I like to top mine with diced onions, shredded cheese, and a dollop of sour cream. Of course for me, those ever-so-nostalgic Fritos are always lurking nearby as well…unless I just made a batch of cornbread!